Avalon residents/property owners may obtain a free library card by providing proof of residence or ownership of property. 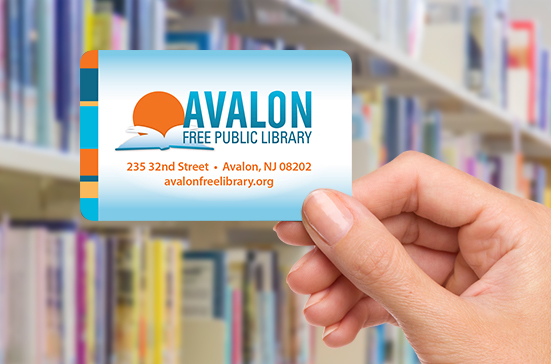 Family members of Avalon residents/property owners may obtain a free card providing the resident/property owner is a Library patron and agrees to the membership of the family member. A signature is required by the resident/property owner. Permanent residents of Cape May County may obtain free library cards by providing proof of residence and presenting ID. Free cards are also available for seasonal visitors to Avalon. Just visiting? Renters and guests of Avalon property owners are eligible for a free seasonal card. Please call 609-967-7155 or visit the Library to learn more about signing up for a Library Card. Avalon Free Public Library is a member of the Coalition of Independent Libraries of South Jersey (COIL).